For over two and a half years, we’ve served the city of Chandigarh alongside our driver-partners, and we’ve learned a lot about the choices riders and driver-partners make, and how those choices impact reliability for our riders and earnings for our driver-partners. Over this period, we have gone from moving thousands of people to lakhs. As the number of people who choose Uber continues to grow, it is exciting to see how we’re serving each neighborhood in Chandigarh with a greater degree of reliability – with every passing day. As Uber continues to grow in Chandigarh, we want to ensure that it continues to be a high-quality platform that seamlessly connects riders to affordable transportation and drivers to viable economic opportunities. 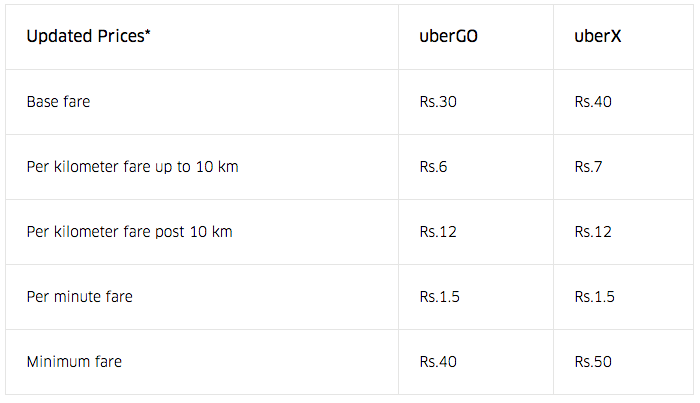 After all, Uber works well when it works for both riders and driver-partners. To align closer with these goals, we’re rolling out a minor adjustment to our fares, with effect from midnight, 14th April 2017. With upfront pricing in the app, you will always know exactly how much you need to pay before you take a ride – this way, you get to decide what’s best for you and your budget.